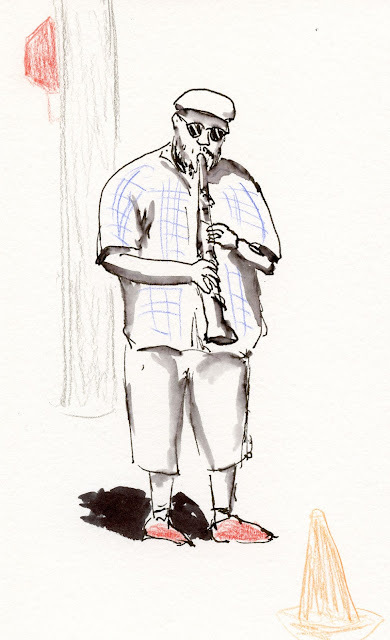 You all know by now how much I enjoy sketching buskers, and our many neighborhood farmers markets are my favorite places to find them. 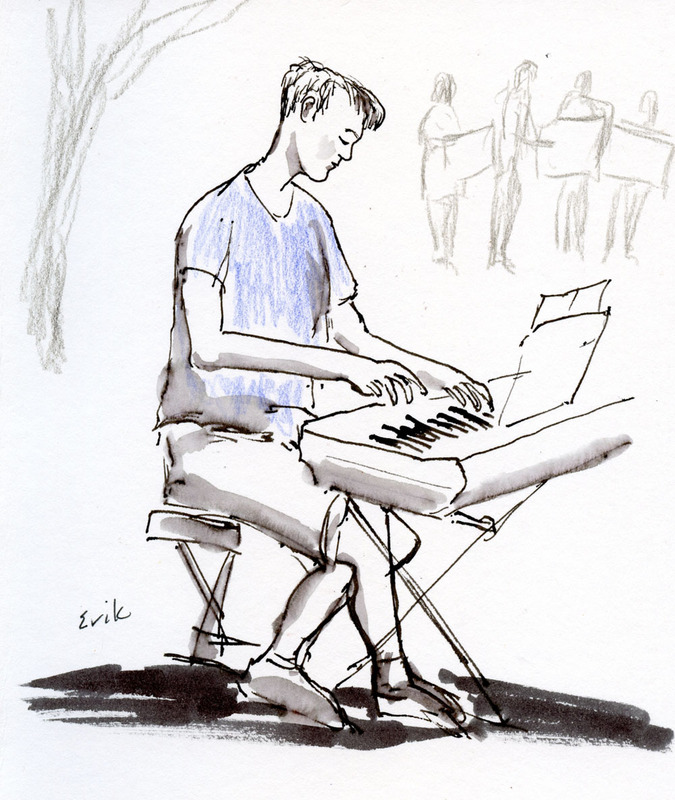 Wednesday in Wallingford, I spotted Erik, a young man playing classical music on a keyboard. 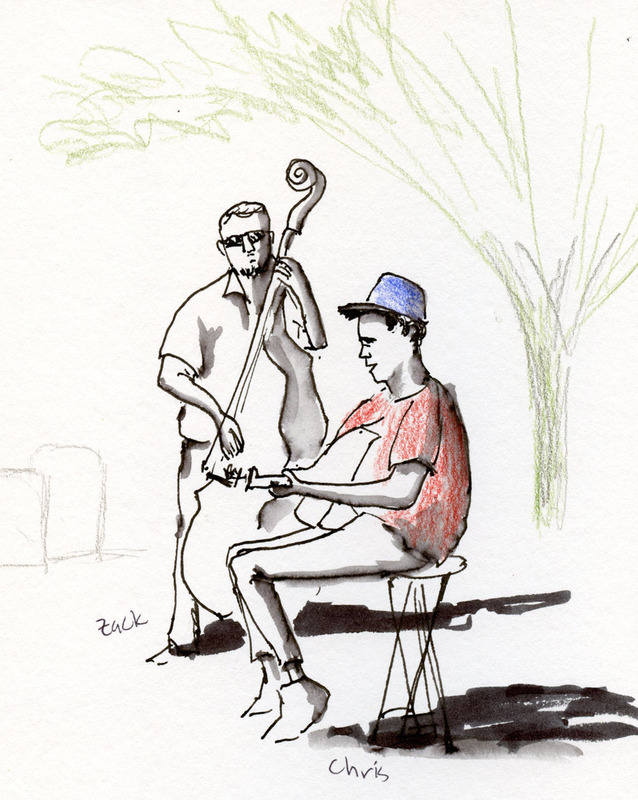 The duo Zack and Chris on bass and guitar were singing original blues in the sunshine. 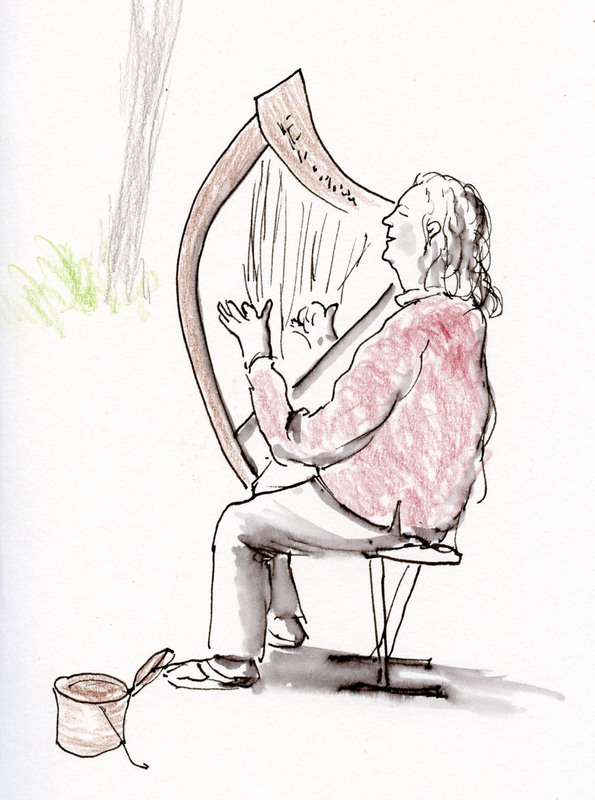 Yesterday at the Lake City Farmers Market, I sketched a harpist quietly playing and singing in the shade. Who knows what I’ll find this afternoon at Phinney Farmers Market. Nothing says summer to me as much as strolling through a market, live music playing in the background, and picking up fresh strawberries on the way out. I hope you’re enjoying the start of summer as much as I am! One is differentiating between local color – the actual hues I see in the heirloom tomato on my desk – and the hues that occur where the light and shade hit the surface of the tomato. My eye sees (and my brain knows) that the dark side of the tomato has some yellow in it, but if I use too much of the actual yellow I “see” there, that bright, warm hue will bring that side of the tomato forward instead of making it recede, and it will no longer look like it’s the dark back side of the tomato. 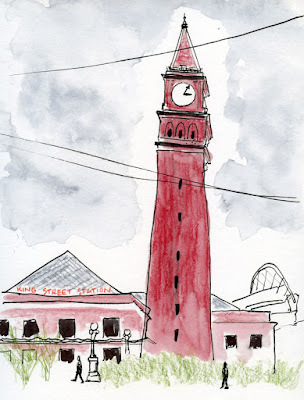 It’s easy to get confused by local color, so I must constantly repeat the mantra I’ve heard in every art class I’ve taken: To make the results “read” accurately, getting the values right is more important than getting the hues right. 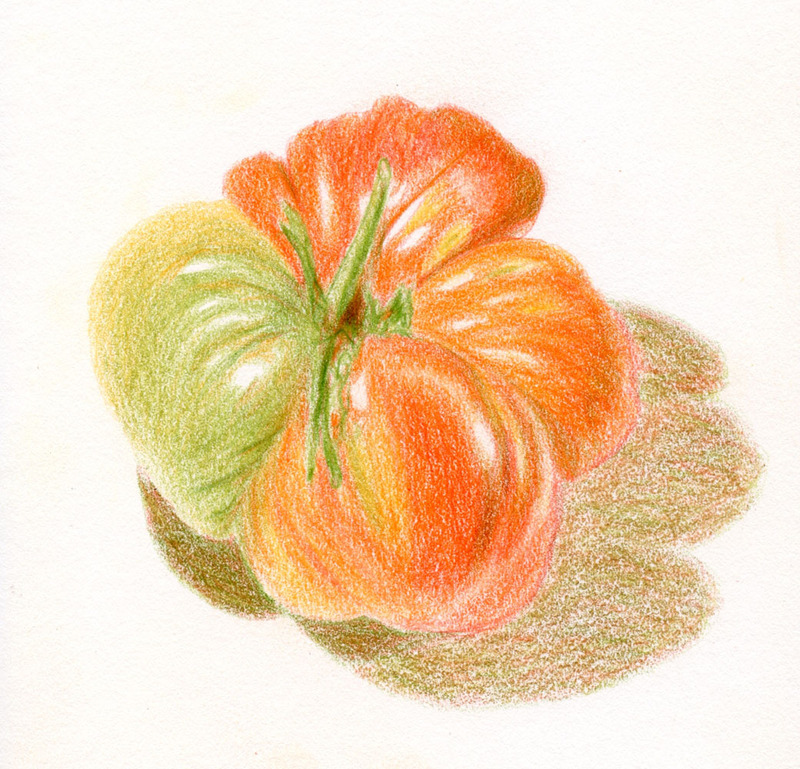 The second struggle is showing the subtle reflection of ambient light on a smooth surface like the skin of a tomato. Since my desktop is matte black, I always put my produce on a sheet of white paper so that it will cast a shadow I can see. But the downside is that the white paper reflects up onto the subject. (Note to self: Get rid of the paper, fake the cast shadow, and lose the paper reflections!) Highlights can be drawn first and saved, but those diffused paper reflections are easy to lose. (The hidden talent of erasers is very helpful when I do lose them.) Actually, strong highlights aren’t that easy, either, because I have too many light sources. My desk lamp creates the intended highlights, which are easy to save because they’re most prominent. But windows on two sides of the room and the overhead lighting also contribute subtle highlights. 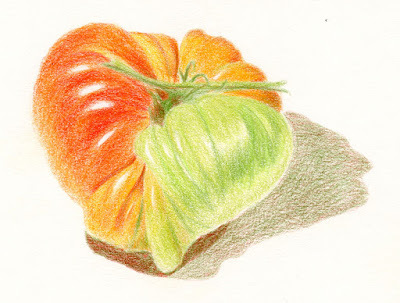 Artistic challenges aside, this particular heirloom tomato was so fantastic in both shape and color that I couldn’t help sketching it twice before it became salad. What an unbelievably crazy form! What gorgeous gradations of color! 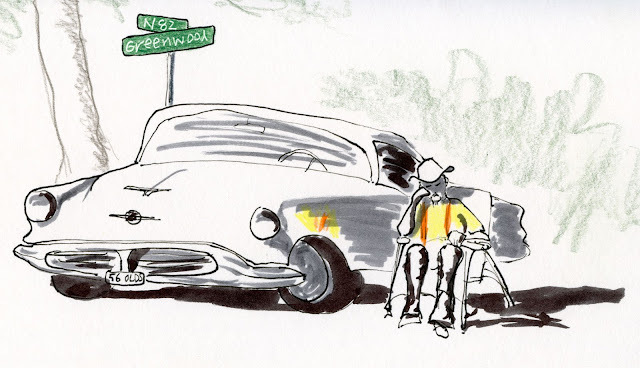 As much as I love urban sketching, I never see color like that in my ‘hood. Yesterday was a busy day of errands and appointments. 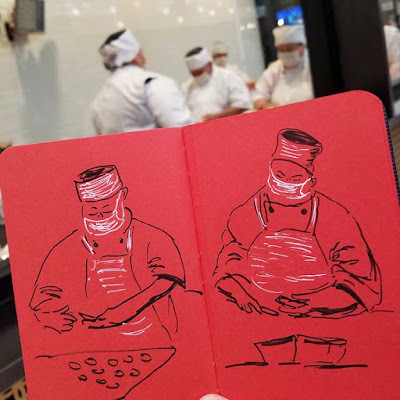 Rushing through Southcenter mall, I stopped short when I spotted the wide windows into the kitchen of Din Tai Fung, where workers were busily making dumplings. The chain of international dumpling restaurants opened this branch just a couple of months ago. I’ve eaten at the University Village location, but the dumpling makers are not visible from the outside there. I glanced at the time: I had exactly seven minutes or I’d be late to my next appointment. I finished with a few seconds to spare. I worried that news reports of dire traffic conditions from freeway lane closures and Pride events would keep sketchers away from the Center of the Universe, but I needn’t have. 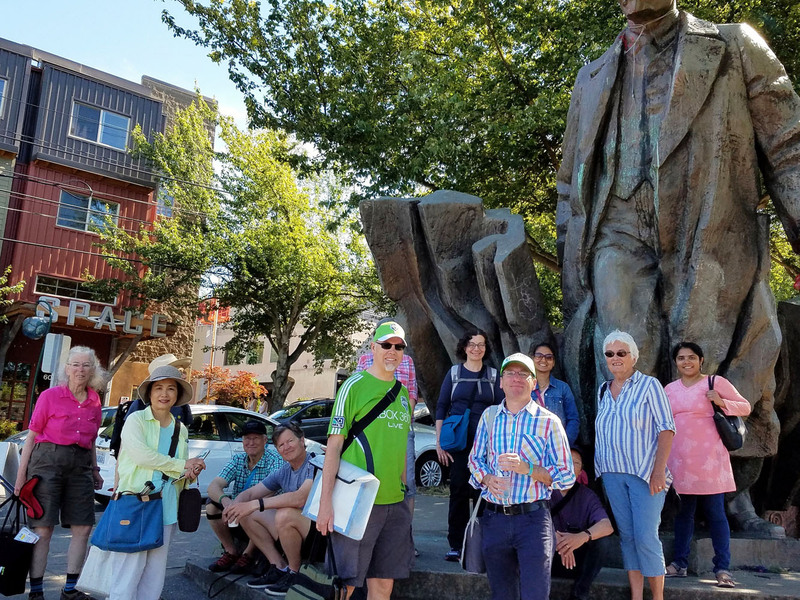 Even predicted temperatures in the mid-90s yesterday brought a good turnout of USk Seattle to the statue of Lenin and the rest of the Fremont neighborhood’s funky environment. 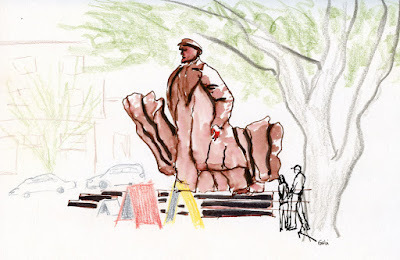 Although I knew I had sketched Lenin before, I didn’t realize until I checked my blog that it had been as long as four years ago at my first outing to Fremont (a month later I sketched him again during Gail and Frank’s USk workshop). It was high time to sketch him again, and I did it first thing while the morning heat was still tolerable. 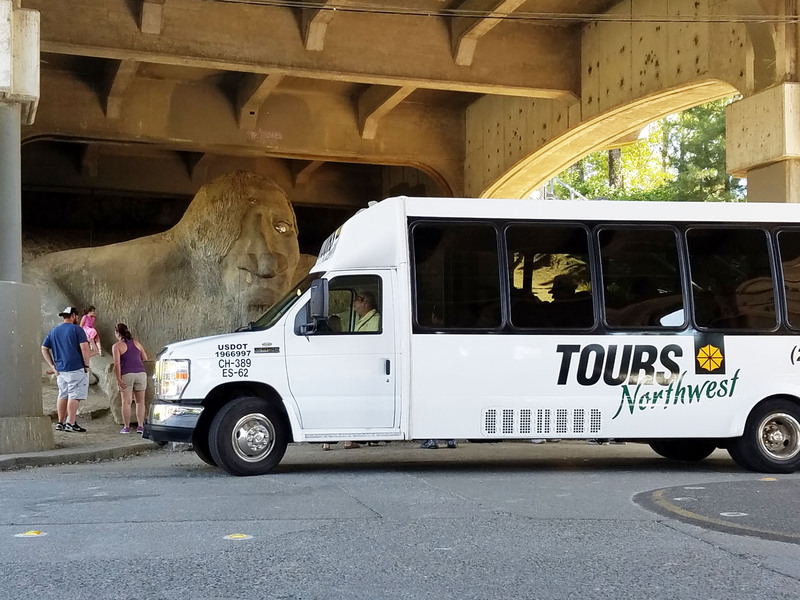 For the high noon sun, I knew exactly where I wanted to sketch: In the cool shade of the Aurora Bridge, where the Fremont Troll waits quietly. 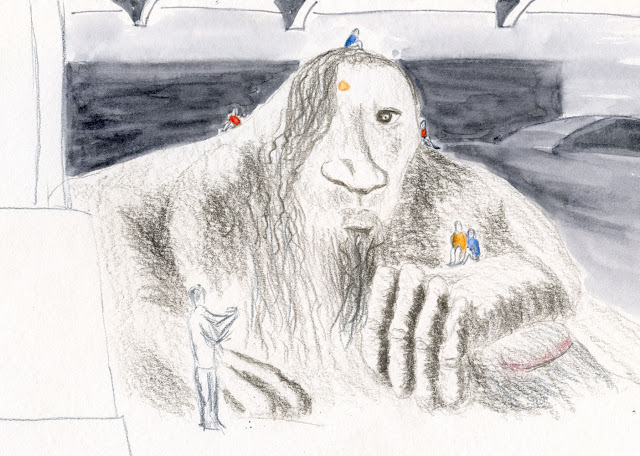 Although a troll under a bridge is supposed to be malevolent, the only other time I sketched him, also four years ago, he struck me as more curious than scary. Yesterday I thought I saw some surprise and endless patience in his single eye (now shiny silver, though in 2013 it was apparently red) as tourists climb all over him, day in, day out. Speaking of patience, I was losing mine as every five minutes or so, a tour bus would come by and disgorge a pile of said tourists so they could photograph each other. The sketch took me much longer than usual because I had to keep waiting for the view to clear. Still, I was in the shade with a cool breeze blowing through. Even on the hottest day of the year, I’d rather be sketching than not. Yesterday was my fifth year at the Greenwood Car Show, probably my favorite summertime event. Subtitled “A mile and a half of classic rides,” the annual show brings together car enthusiasts and their shiny, souped-up vehicles from all over the region. I’ve sketched at this event under the threat of rain and in actual rain, but yesterday precipitation was nowhere in sight as cars of all makes lined 20 blocks of Seattle’s Greenwood Avenue. The show officially opens at 8 a.m., but as has been my habit, I arrived before 7:30 a.m. to beat both the expected heat and the crowds. In previous years, I’ve usually sketched portraits of individual cars that caught my fancy, and sometimes I overheard fun stories from the owners that way. 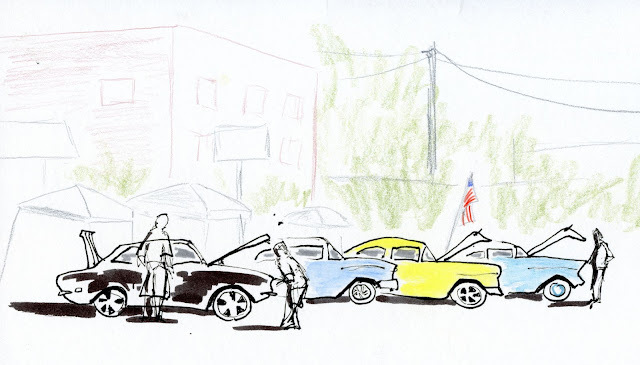 This year I took a different approach by stepping back a bit to sketch groups of cars and the general ambiance. All around me buzzed the language of gearheads comparing notes on the years of work they’ve lovingly put into their vehicles. Although I couldn’t comprehend their camshafts and manifolds and customized whatnots, I understood their labor of love. For one day a year, they get together on this street of dreams to share their common passion. 6/24/17 It's a long day at the Greenwood Car Show. 6/24/17 Busker entertaining the crowd. There’s something about those weird, industrial, almost abstract structures at Gas Works Park that invites me to be bolder and more experimental. 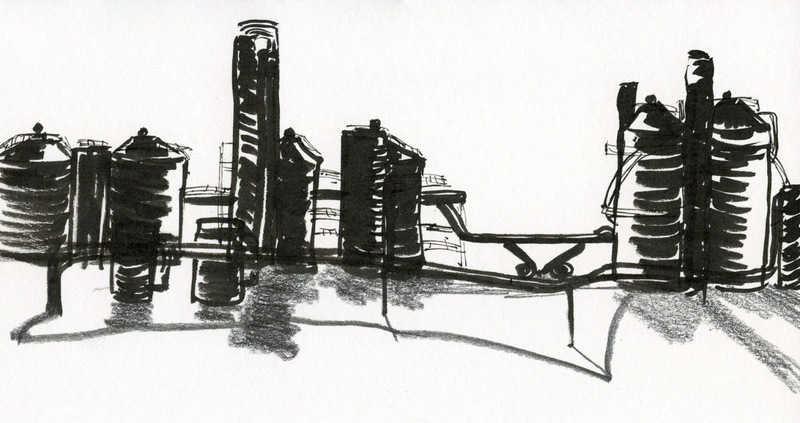 Yesterday I was in a brush pen mood, so I started with my “hairy” Sailor Profit brush pen to sketch the fully backlit gas works (above). When it was time to put in the strong shadows, I wanted to distinguish them from the silhouetted gas works themselves, so I grabbed the next darkest, boldest implement in my bag: a super-soft (8B grade) Gekkoso graphite pencil. Finally, I used my usual Sailor fude fountain pen to put in a few details. For my second sketch of some different gas works (at right), I used the brush pen and fountain pen only. I was also in the mood to sketch a tree portrait (which I enjoy doing, though I don’t do it often). Unlike some Seattle parks, Gas Works is ringed by large masses of trees but without isolated trees within the park that are easy to see individually. On my way out of the park, I finally found one near the parking lot that seemed like a good portrait exercise. 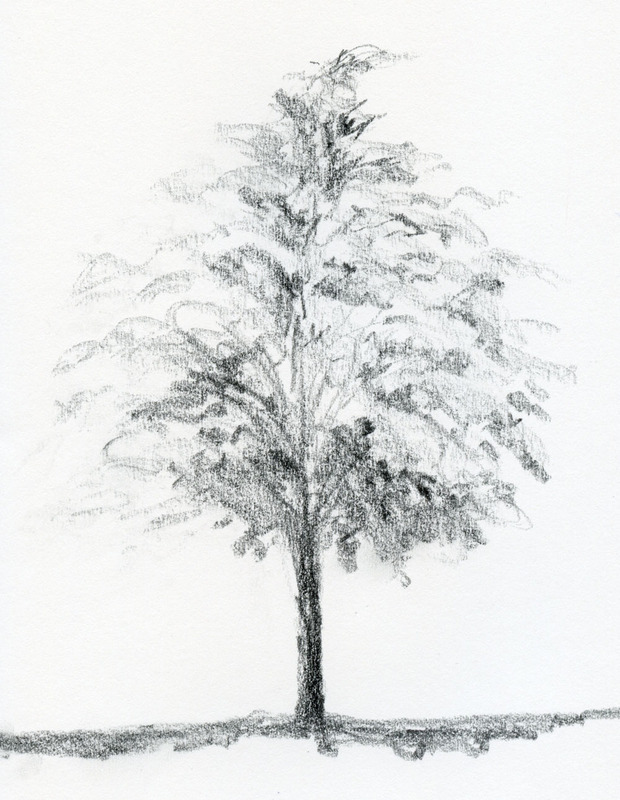 I’ve been rather enamored lately with that Gekkoso pencil (I used it for the first time the other day on the unexpected lion fountain in my neighborhood), so I pulled it out again for the tree. I’ll probably write a full review of the Gekkoso one of these days. . . it’s a very interesting pencil. Although it’s not called a “brush pencil” as the Uni Mitsubishi 10B is, I would put it in the same category of very soft, extra-thick cores. For many years, I wrote daily “morning pages” as recommended by Julia Cameron in her well-known book, The Artist’s Way. The concept is to write a few journal pages shortly after waking to release whatever mental baggage you might have and make room for creative energy so you can move on to a productive day. The direct focus of stream-of-consciousness writing for those few minutes quiets your mind. Eventually I figured out that this release of potentially negative energy through writing works better for me if I do it in the evening before bed, because it helps me sleep better. That’s still my journal-writing time now. 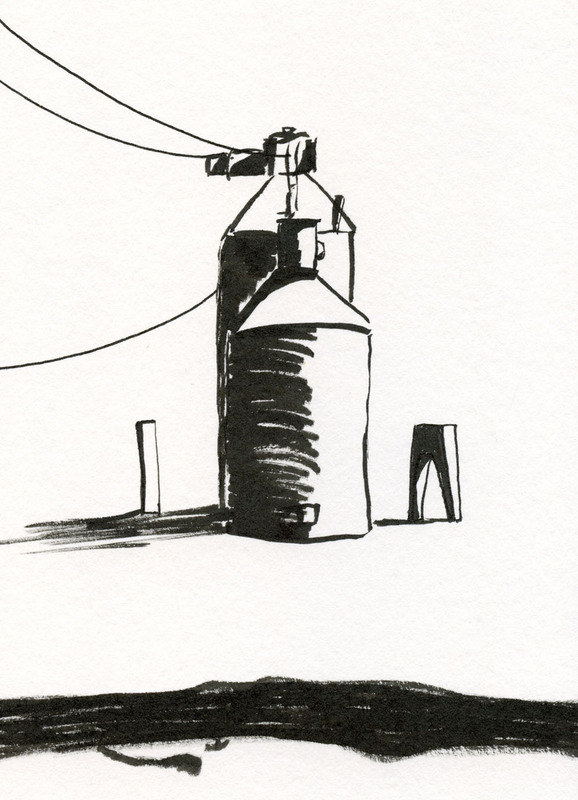 I’ve come to realize that drawing a small, simple still life first thing in the morning serves a similar purpose as morning pages. The focused concentration relaxes me even as I’m challenged by the exercise, and the repetitive quality feels like a ritual rather than a boring habit. In past years, sketching an apple or a banana from the kitchen used to be my way of getting through the bad-weather months when I couldn’t sketch outdoors. Back then I didn’t necessarily enjoy it – it was just something to do while I waited for the weather to improve. 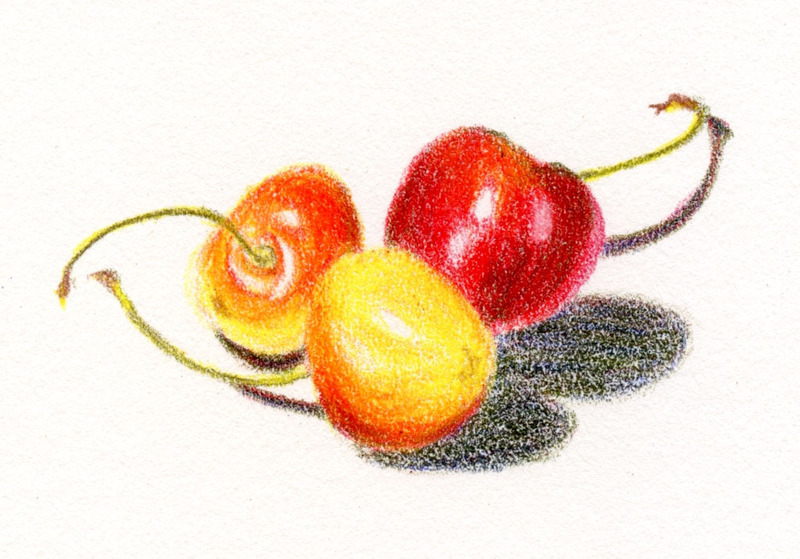 But the more I did them, the more I appreciated what I can learn from still lives, especially this past winter when I spent several months studying the use of colored pencils. 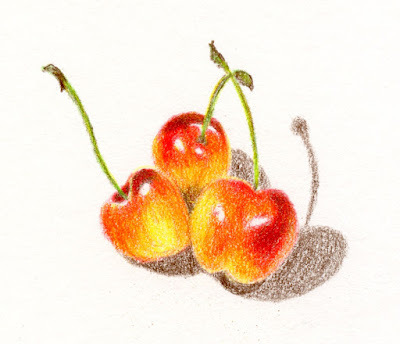 In recent weeks as the weather has warmed up, and I’ve been able to sketch outdoors again, I found that I still wanted to sketch cherries or tomatoes, even though I have plenty of other subject matter now. Mind you, I don’t prefer still lives over urban sketching; drawing on location is still the most fun and engaging type of drawing I do. 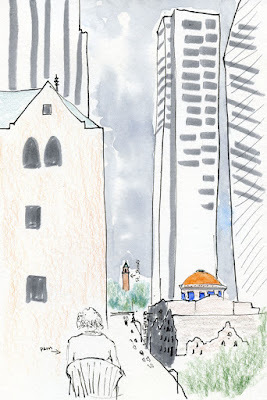 But urban sketching requires a very different type of focus and energy than anything I can do at my desk. 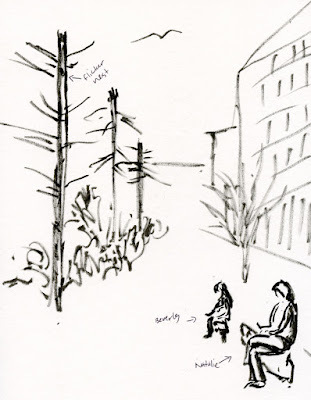 Sketching on location is about looking for appealing subject matter and keeping up with the challenges of constantly changing light and other outdoor conditions and restrictions (those challenges are half the fun! ), but it isn’t exactly relaxing. 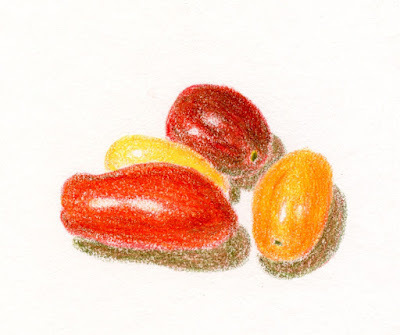 Drawing a small still life, on the other hand, is relaxing in a quiet, meditative way. It prepares my hand, eye and brain for a creative day – hopefully filled with more sketching. The exercise gives a ritualistic quality to my morning, and when I don’t do it, I miss it. 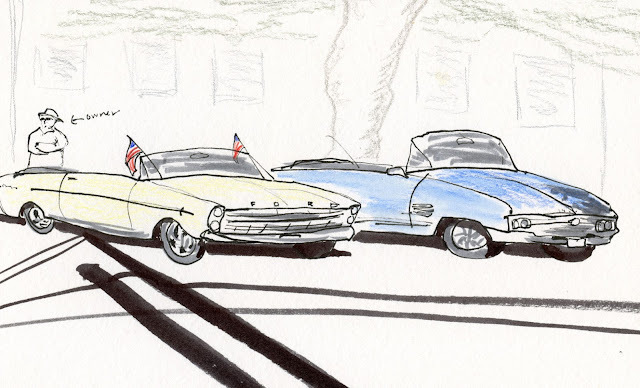 I often cruise around my neighborhood – on foot when the weather is favorable, by car when it’s not – looking for a sketch. Most of what I see is predictable and commonplace. Imagine my surprise when I happened upon a large, ornate, three-tiered fountain surrounded by lion heads on each tier. 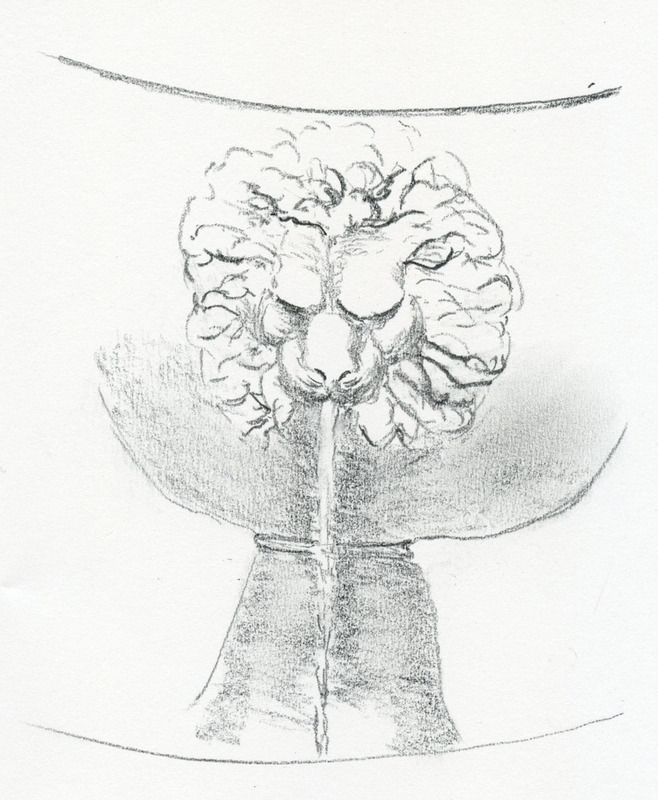 The house was set back a bit from the sidewalk, and the fountain was in front, water pouring from each lion’s mouth. I saw these often in Italy and France, but rarely in Seattle, and never in little ol’ Maple Leaf. Once I got over my shock, I pulled out a pencil. 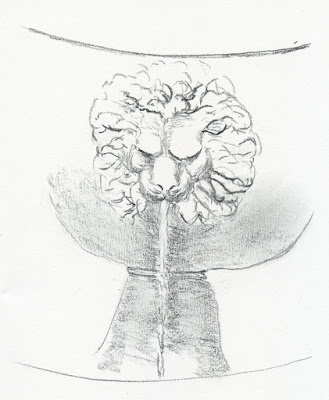 Maybe one of these days I’ll bring my stool, settle in for an hour or two and sketch the whole thing – all 12 lion heads. with all my pencils bunched up. 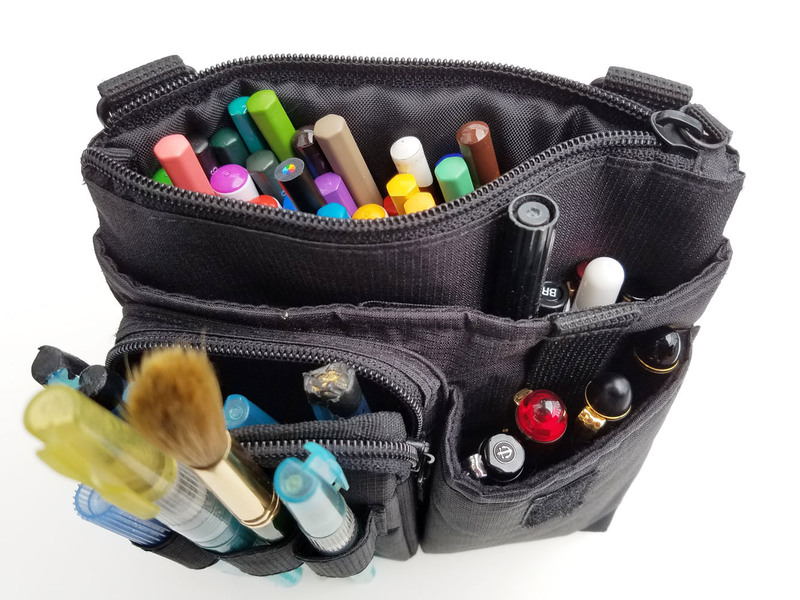 Are sketchers ever completely happy with their bag or sketch kit-carry system? 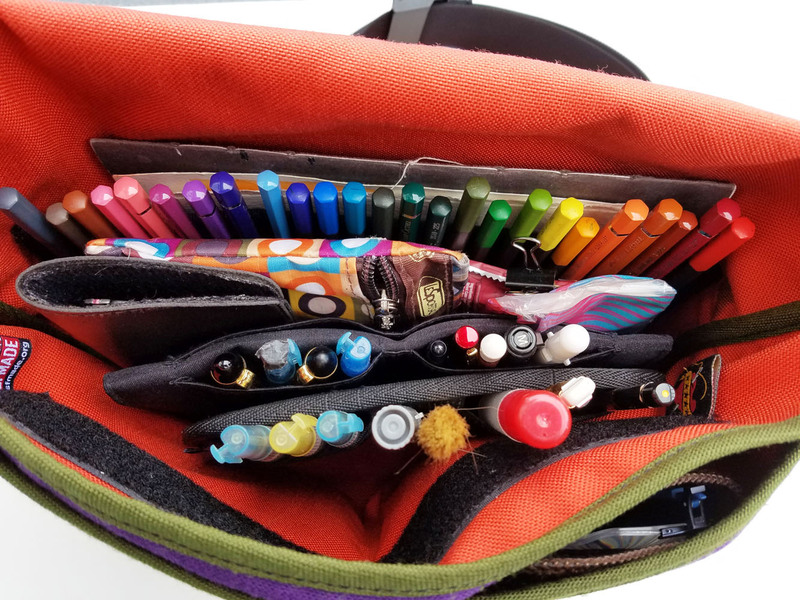 For years, I almost was – all my tools and materials fit comfortably and compactly in my everyday-carry Rickshaw messenger bag. 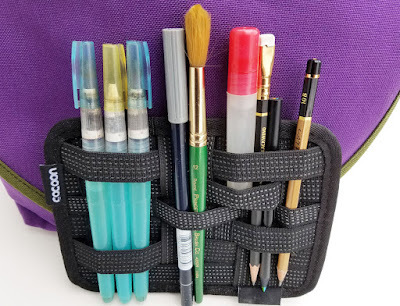 My only issue was finding a way to keep all my implements standing upright (which is an absolute requirement for the way I like to sketch) and instantly accessible. A big improvement a couple of years ago was the Kutsuwa Dr. Ion bag organizer that I found in Tokyo. At last, I was completely happy and satisfied – all my bag organization needs were met. The Tran Portfolio: like painting the livingroom walls. 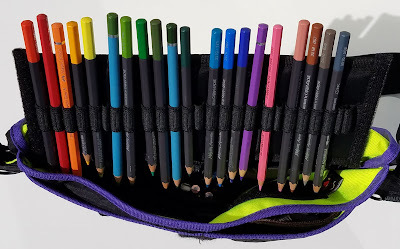 The Tran Portfolio made me realize how much I prefer having all my colored pencils in a single row, and I no longer liked the way the rest of my tools bunched up in the Dr. Ion’s roomy pockets (the largest of which was now unused, since the colored pencils were now in the Tran). I didn’t need a second Tran Portfolio, which would have been overkill for the remaining tools, but I wanted something else like it. First I found the Lihit Lab Slim Pen Case, which has a couple of slender pockets. The whole thing is meant to fold in half like a billfold, but I leave it open in my bag, and it keeps nine or 10 implements standing upright in a single flat row. 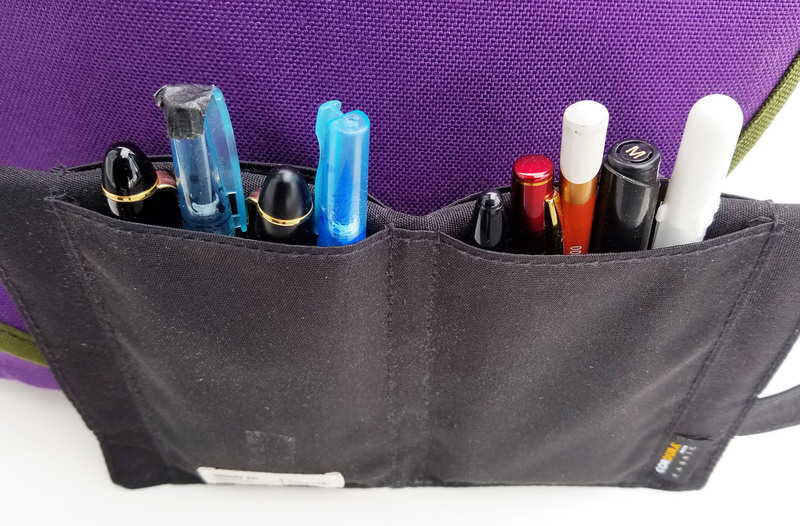 There’s no room for them to bunch up as in the Dr. Ion, and the pockets are too narrow for short pencils to fall down and get lost – perfect! The only problem was that I still had about eight more implements that wouldn’t fit in the Lihit Lab, but I felt like I was on the right track. Next I found the Cocoon Grid-it Organizer in the extra-small size. A bunch of elastic strips criss-crossing over a stiff board, the Grid-it is designed to hold and organize whatever random gadgets you carry. I’ve known about these Grid-its for a while, but the ones I’d seen were as large as laptops and would never fit in my bag – until the 5-by-7-inch size caught my attention. I put my remaining implements into the Grid-it, and like the Lihit Lab Slim Pen Case and Tran Portfolio, it’s slim, compact and allows everything to stand upright in single file, just as I want them to, and they also feel very secure – too secure. The only thing I don’t like about the Grid-it is that the elastic strips are very tight, which means I sometimes struggle to get tools back into the loops. I think they might loosen up after some use, but maybe not, since the system is designed to hold everything in place securely. I do like the way all three components fit together nicely in my bag with minimal bulk (compared to the Dr. Ion, which is a bit bulkier). I’ll give these a try for a while and see how they go. Bird's eye view of my Rickshaw bag: All three components keep my tools upright and fully accessible. USk Seattle’s 10x10 workshop series culminated yesterday morning with a group reportage activity at Lake Union Park. 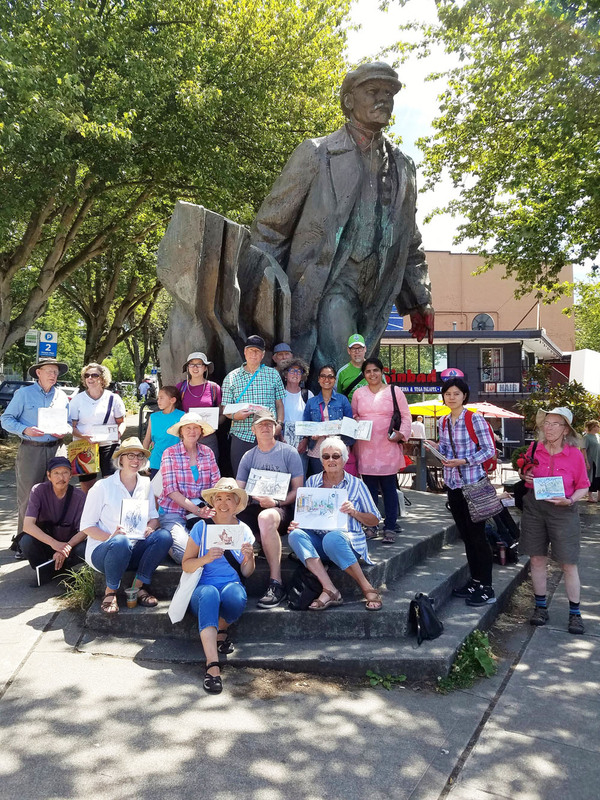 While I didn’t take part in the workshop, I joined the general sketchcrawl that followed in the same location, which is one of my favorite Seattle parks. 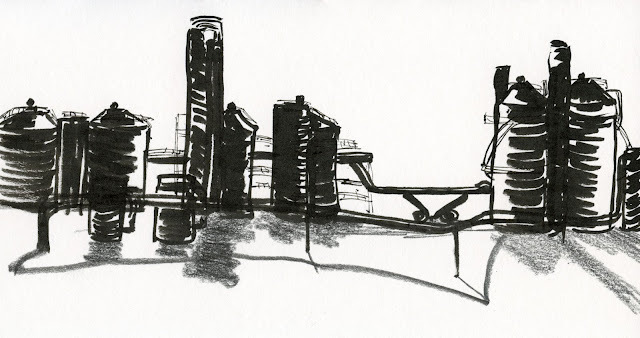 I’ve sketched parts of the skyline from the park a few times, most recently last summer, but I’ve never had my panoramic Stillman & Birn sketchbook there. The landscape book was still in my bag from Friday’s outing in Tacoma, so I took advantage of it to capture as many as possible of the 14 cranes visible from that spot (I only got 11, and then I ran out of space). The day dawned with typical mid-June wishy-washiness: It could end up with “sun breaks” just as easily as it could rain. 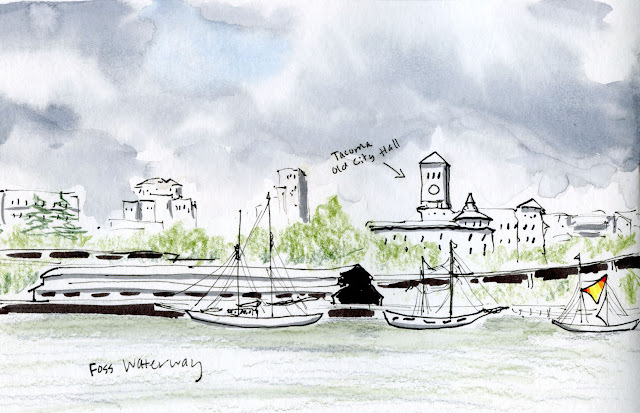 I took a chance on the former to join Urban Sketchers Tacoma at Foss Waterway, which was the site of this weekend’s Festival of Sail. 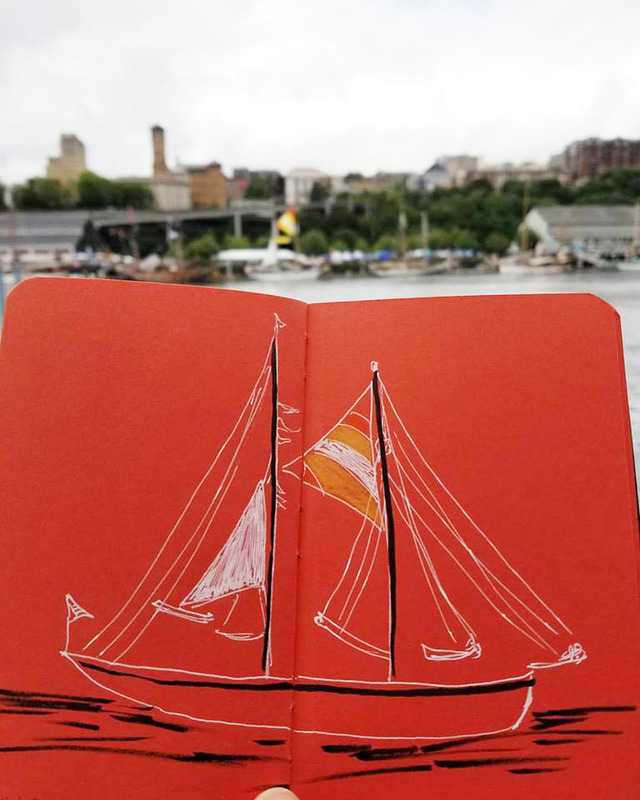 With my landscape-format Stillman & Birn sketchbook on the panorama setting, I tried to squeeze in as many as I could of the dozen or more tall ships across the waterway. It was the first time I’d seen Tacoma’s skyline from that direction, so even though my focus was on the ships, I couldn’t resist putting in Old City Hall (left of center). My next plan was to make a detailed sketch of one of the ships – the only one that had some of its sails up (it’s near the center of the panorama). Since white rigging is always a bother to save out in a sketch on white paper, I took the easy way out and sketched it on red paper. I always seem to have five or 10 minutes left to kill before the sketchbook throwdown, so I used them to capture the row of snags (one of them was home to a family of flickers) next to the waterway where Natalie and Beverly were sketching. 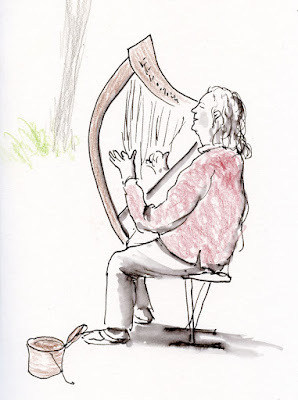 The morning’s gamble was a good one: Not a drop of rain all day, and despite the chilly wind and thick cloud cover, we had a good turnout of enthusiastic sketchers. Gage Academy recently initiated a new membership program. 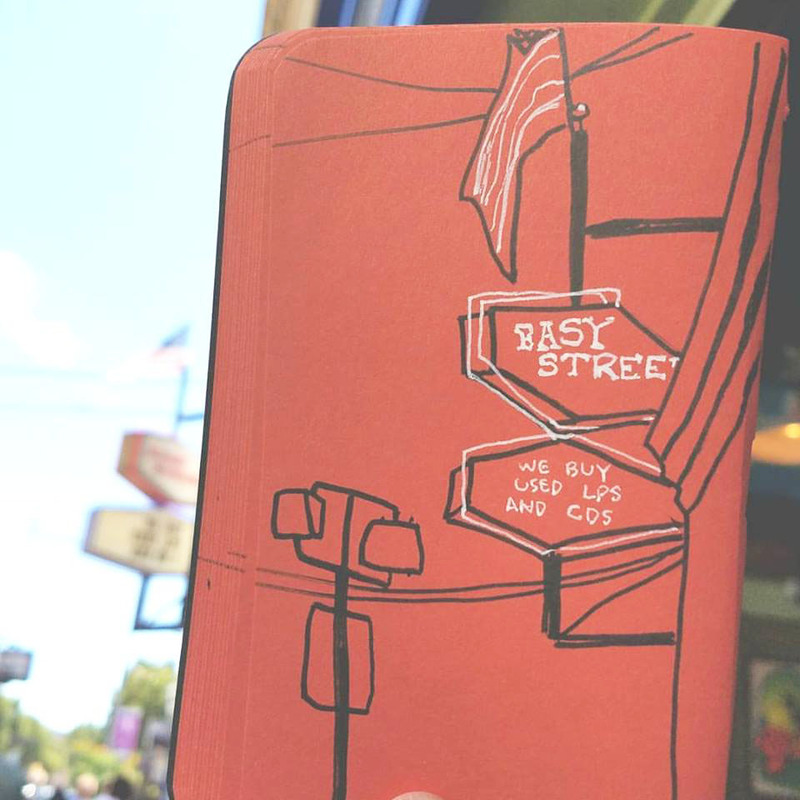 For $75 a year, you get a stack of benefits, the best of which are eight free life-drawing sessions, discounts on more sessions and a free ticket to Drawing Jam. Those benefits alone more than pay for membership. With all the excellent classes I’ve taken the past few years in colored pencil drawing, sketching quickly, life drawing and pen and ink, not to mention all the fun at Drawing Jam each year, I signed up immediately – both to support a terrific art school and to take advantage of the great bennies. 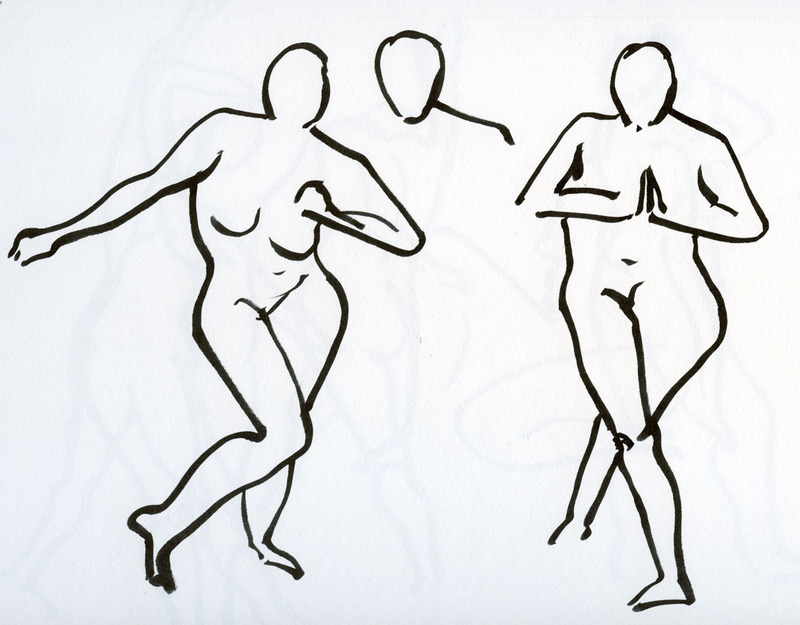 I typically go to life drawing only during the winter, but now that I have this membership pass, I’m going to try to go more regularly all year long. Well, OK, maybe only when it rains, but it still rains plenty year-round. Like last Thursday. And yesterday. I seem to be on a Seattle icon roll (not to be mistaken for a Seattle roll). You already saw the six I managed to hit in one day last Friday. 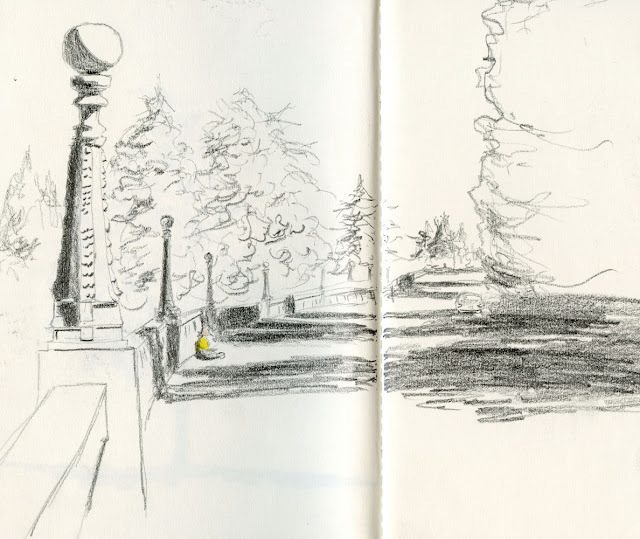 Yesterday I had only a bit of time in the International District, so I went straight to the small park across from the King Street Station. I’ve sketched it at least a couple of times before – once about a year ago and back in 2013, too. It’s a classic shape that I’m still not tired of sketching. Frankly, each time I do it, a different part looks wonky, so it never hurts to keep practicing. 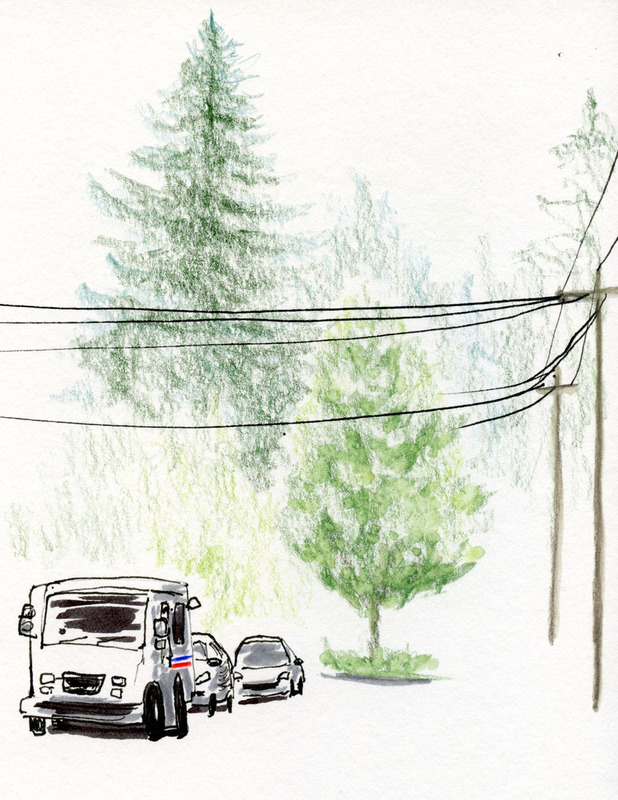 So I like cheap thrills: I get excited when I spot a mail truck within sketching distance. It’s not just that they’re cute and fun to sketch; it’s the added challenge that its driver is likely to return soon. I’ve bagged two previously – one last January and one a couple of years ago. Driving through the Wedgwood neighborhood yesterday, I pulled over immediately when I saw this one. Almost as soon as I put pen to paper, I saw the mail carrier returning. I drew faster and faster, quickly throwing on shadows as she rearranged parcels for her next stop. I was still making the last of my tick marks around the truck to help me place the cars and other elements around it when the carrier hopped in and drove off. Yes! Bagged another one! 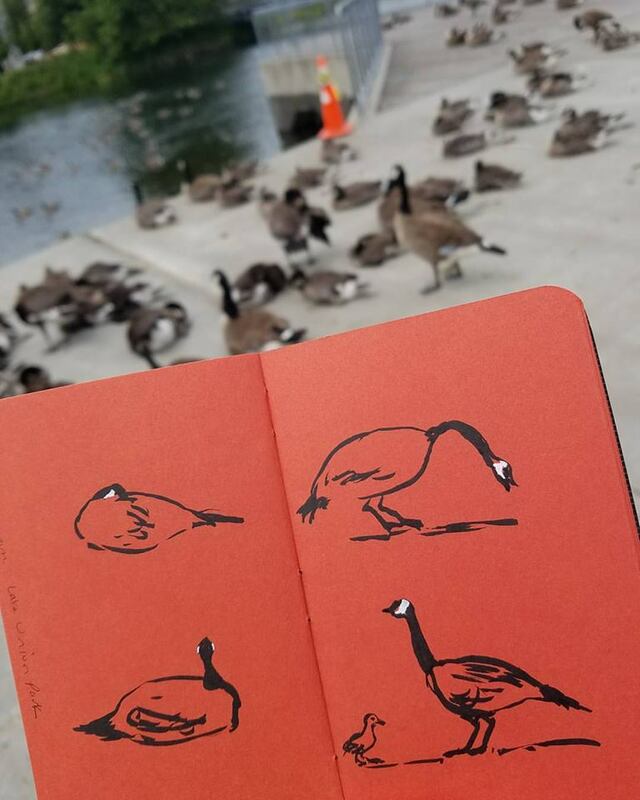 You know what else I’d love to sketch? A garbage or recycling truck! I managed to get one from the distance several years ago, but I’d like to get more detail. Despite their ubiquity, they hardly stop at all, so they are truly elusive. Once I got stuck behind a garbage truck on a narrow residential street and had to follow it for quite a while; if I hadn’t been driving, I would have had plenty of time to sketch its rear end. Mail trucks have become too easy. I’m after bigger game now. Although the West Seattle Farmers Market is one of few in Seattle open year-round, my visit yesterday was the first market of the year for me – so I’ve officially declared the opening of the farmers market season! 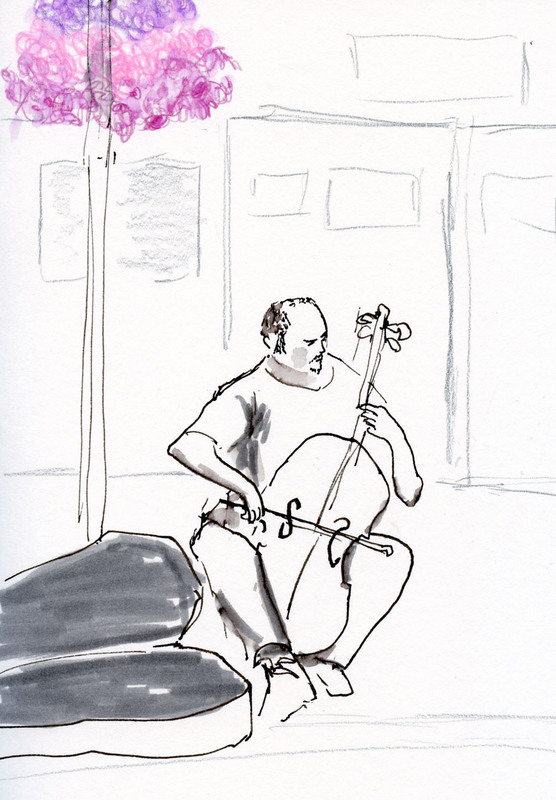 Unfortunately, I didn’t get there until afternoon with only an hour before closing, so these sketches of a cello busker and the Easy Street Records sign (which I sketched almost exactly a year ago) were all I had time for. Most of the summer-only markets opened last week, though, so I’ll have one to go to nearly every day of the week for the next few months. Ahhh, summer! So short, so sweet. Moo cards and stickers, too! 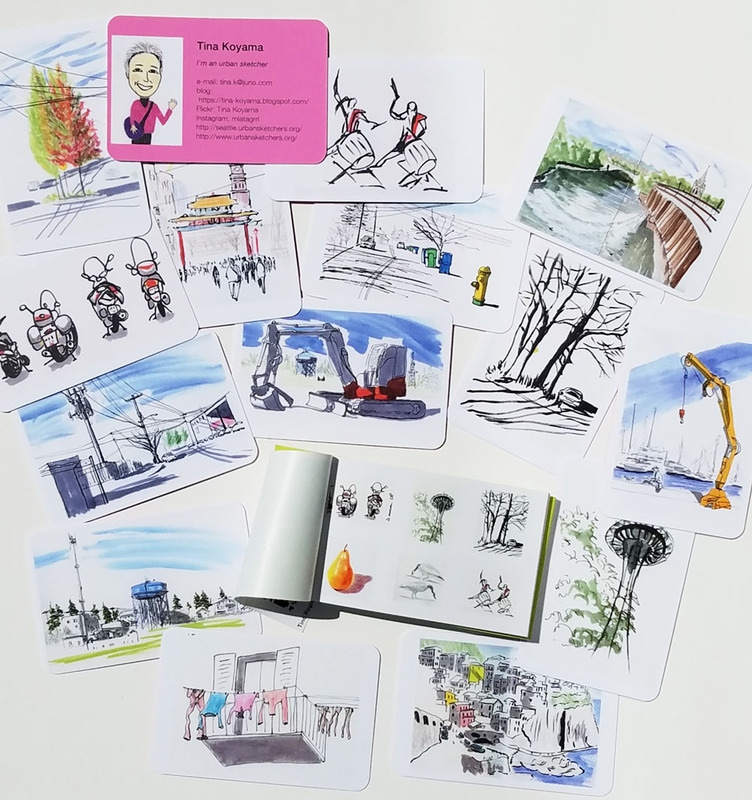 One tradition of the Urban Sketchers Symposium is for participants to bring small cards to exchange with other sketchers. Like business cards, they have contact information on one side and a sketch printed on the other. It’s a fun way to remember people and stay in touch long after the symposium is over. For the first two symposiums I attended, I printed my own cards at home, which was enjoyable as well as inexpensive, but I didn’t like all the cutting. Last year I finally got some Moo cards made. Popular with urban sketchers and other artists, Moo is an online company that prints small cards, but unlike some printers, Moo allows you to print as many images as you want on an order of cards for the same price as printing the same image on all the cards. Then on a whim (and good upselling by Moo, which made it very easy to add to my order), I sprang for stickers, too. It was even more challenging finding images that fit the 1-inch square format, but who can resist stickers! (However, they aren’t very well made – the perforation isn’t complete, so it’s hard to peel the backing off.) You can see the book of stickers near the center of my photo. After three symposiums, I have a nice stack of cards I’ve traded with others. I’m looking forward to adding to the stack in Chicago next month! How many icons can a person sketch in one day? 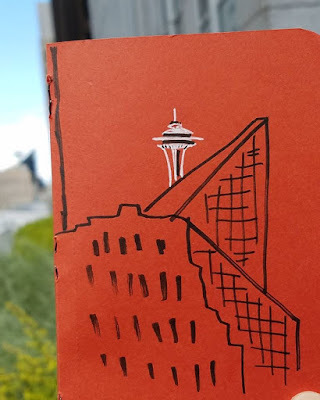 When I started out yesterday for the Urban Sketchers Seattle gathering, I didn’t know I would end up sketching several icons, including two on my “must sketch someday” list. The meeting place was the Fourth and Madison Building’s seventh floor terrace – a pleasant outdoor space for nearby workers to bring their bag lunches and for sketchers to catch unusual peek-a-boo views. 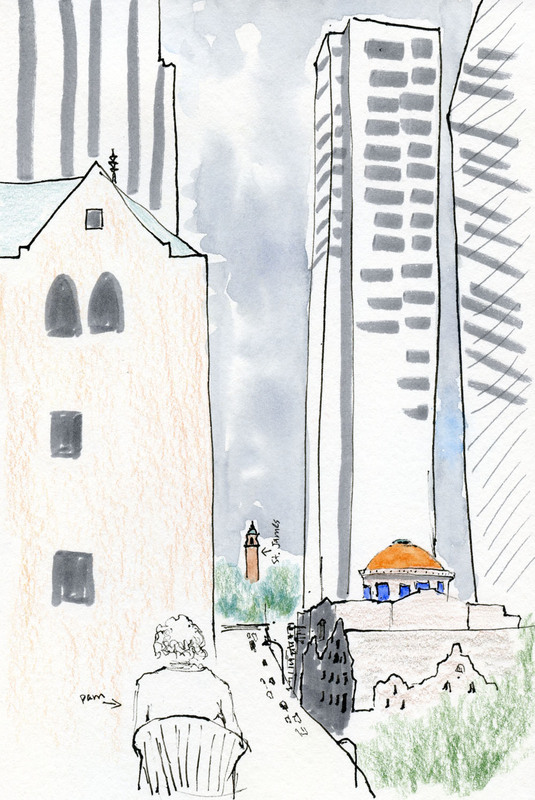 The one I (and many other sketchers) chose was looking east on Madison Street toward St. James Cathedral at the top of the hill looking very tiny in the steel and glass canyon. However, that’s not one of the “must sketch” icons I was referring to. For one I went down to the building’s lobby, where a large window faced the Seattle Public Library’s downtown branch. 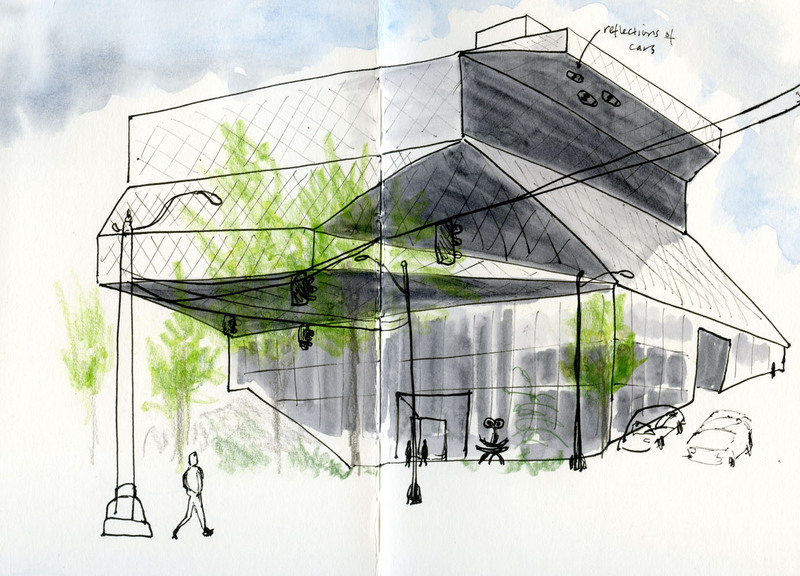 Although I’ve sketched inside this flagship library building several times, I’ve never sketched the whole building, although I’ve wanted to. Designed by Rem Koolhaas and Joshua Prince-Ramus, the unusual and striking building has always seemed too intimidating. Yet as I gazed at it yesterday, I had the same feeling I had while sketching in Positano or the Walt Disney Concert Hall in L.A.: The architectural lines are so unconventional and unexpected, who would know if my sketch were wonky? I took it on. 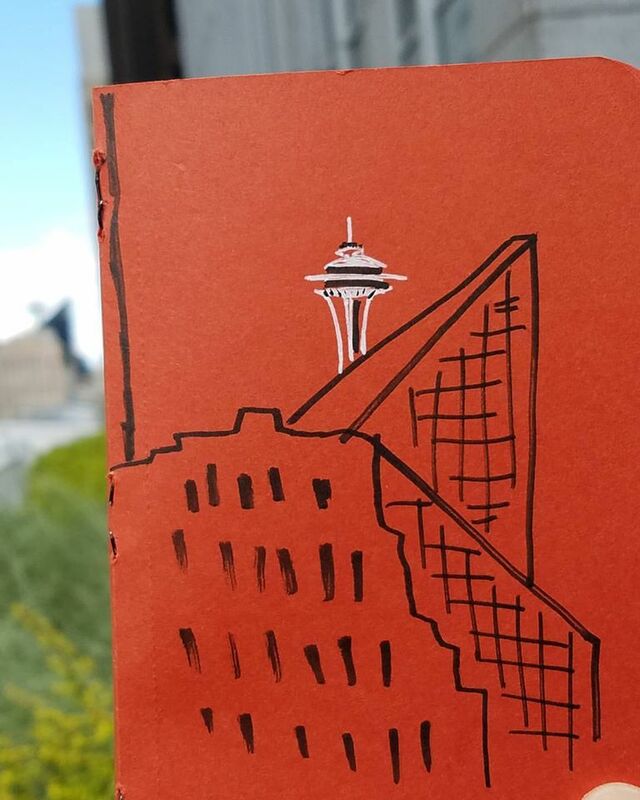 By then I had only five minutes left before the sketchbook throwdown, so I quickly went back up to the seventh floor terrace for the other peek-a-boo view I’d considered: The Space Needle hiding behind the “Darth Vader” (Fourth and Blanchard) Building. 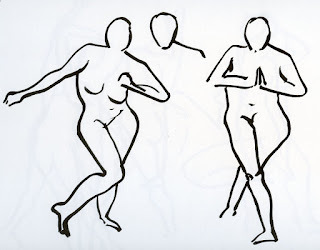 However, that, too, is not one of the two “must sketch” icons I was referring to. 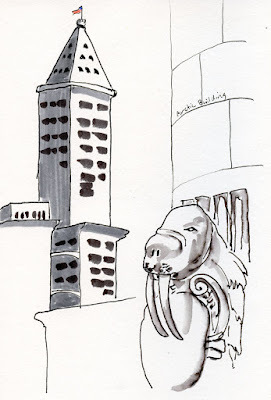 The second one was a walrus on the side of the Arctic Building. One of few old buildings in Seattle with any kind of gargoyles or other cool exterior decorations, it has walruses all the way around, way above eye level. Luckily for me, this one was adjacent to a parking lot, so I could stand next to it instead of on the street, where I would have had to look straight up to sketch. 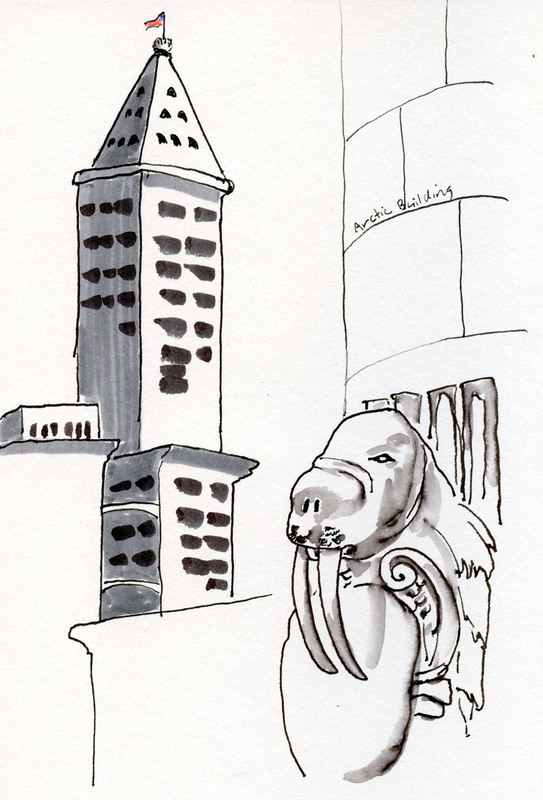 As a bonus, the Smith Tower was right next to it! Whew. 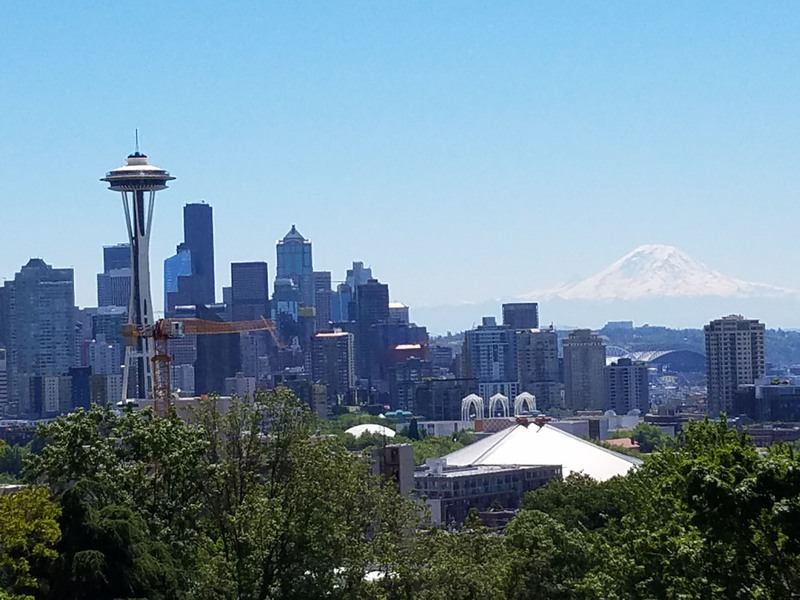 I think I hit my Seattle icon quota for the year. The Bostitch Quiet Sharp 6: My Electric Grail?